Saccades are quick, short movements of the eyes. The cavemen used them to quickly assess the environment and see where a threat (or dinner) might be. We use them now for reading, in a series of quick movements and fixation. We also use saccades to update changes in our environment, so they are influenced by peripheral awareness. They help build a spatial map of the environment. The movements are involuntary and triggered by changes in the spatial environment. One can look for inaccurate saccades associated with TBI, concussions and strokes. Inaccurate saccades are also associated with most binocular vision problems, like convergence insufficiency. Poor reading performance can be related to inaccurate saccades as well. Saccades testing can show a therapist overshooting or undershooting during the movements, but objective measurement helps set goals. 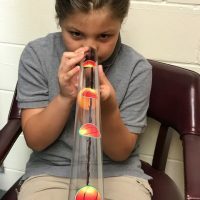 Tools like the Viso-Graph or Right-Eye may be used by the vision therapy doctor to measure these saccade inaccuracies, but these can be pricy solutions often out of reach for the typical therapy clinic or school-based therapist. The King-Devick, a tool originally developed for field side concussion testing, can also be used for saccade assessment. It now has aged-based norms for their number reading task making it a useful tool for goal-making. It is available as an iPad app at various prices depending on features. The DEM provides good objective data concerning eye movement accuracy. It correlates well to reading fluency. It is inexpensive and quick to give and score. The Developmental Eye Movement test (DEM), is a standardized assessment of saccade accuracy. It is standardized for 5-13 year olds, though testing indicates values for a 13 year old are generally valid for an adult. The DEM has 4 parts, all involve the timed reading of a list of numbers. The first part is sample of horizontal numbers used to insure the patient can see the text adequately. In the next section, two vertical columns of numbers are read and timed with errors noted. There are two vertical tests with the times added. There is the final horizontal test which present horizontal lines of unevenly spaced numbers, which the subject reads while being timed with omissions and substitutions noted. Times are compared to norms based on age or grade percentiles, They are then used to derive a ratio of horizontal to vertical times that help to identify the cause of the errors, either automatically (subjects ability to call out numbers) versus ocular motor difficulty. The DEM is not perfect as the person must be verbal and recognize numbers. Frequently the task of reading out loud produces a lot anxiety for children that have problems with the task also. Observation of behaviors during the DEM and the reading can also give some insight. does the child hold the material very close to his face ? does he squint or rub his eyes during the assessment? does he use his finger to follow the letters? does he move his head during testing? This is very telling as using head movement rather than eye movement slows fluency and saccade accuracy. does accuracy of words get worse as the reading continues or does the child use context to fabricate the end of the sentence? Does he turn his head to the left or right? Following reading, ask some specific questions if the child had difficulty to help identify what the child is seeing. These questions sound crazy, but make perfect sense to child with saccade or near vision problems. do the words move when try to read them? do they blurry then clear then blurry? do they appear to float? Sometimes the children have a hard time describing just what they see. Parents are often very surprised at the responses to these questions as the child did not know that they are not seeing well. The treatment for saccade problems, like all ocular motor problems, assumes the child is in best corrected visual acuity. The Hart Chart Decoding activity is also a good task. This task has a grid of letters on one sheet and themed (there’s SpongeBob and Sports, and others)secret messages on another. Each letter in the massage corresponds to a column/row combination that the child counts to find the letter. Initially the child is allowed to use his finger to help count the rows and columns, but as they get better at the task, the finger is no longer allowed. EyeCanLearn.com is an amazing website with vision games and printable with saccade activities. Having a child read the first letter of words in a paragraph can improve saccade accuracy as well simple vertical strips of letters that can be more further apart. The therapist can add a metronome to these tasks to help increase the pace. Add balance to these task to increase the challenge of the brain and visual system. Saccade strips are two strips of paper with vertical letters. The patient reads the letters left to right and top to bottom. Start with the strips close together then separate them as the the patient gets quicker. Remember to keep the head still, even if the therapist has to help! 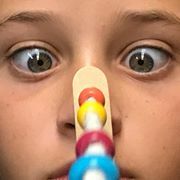 This entry was posted in pediatric and tagged balance, brain injury, convergence insufficiency, eye movements, neurological rehabilitation, occupational therapy, optomtery, pediatric optometry, pursuits, saccades, vision rehabilitation. Bookmark the permalink.